Past and current contents of this site ©1999-2005 the Chicago Djembe Project. May not be re-used or reprinted in any form without permission. DIRECT FROM GUINEA TO CHICAGO! 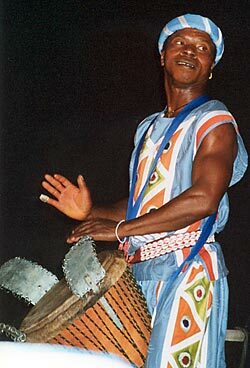 The Malinke Djembe Drumming Tradition from Hamana returns to Chicago! Fresh from his role as Second Soloist on Famoudou Konate's 2002 European Tour, Nansedy Keita brings his tremendous skills and knowledge to the United States for the first time--along with his talented fellow Konate apprentice, Sayon Camara.